Homeschool Mosaic Review: Spanish for You! | Educate. Renovate. Celebrate. adventures in homeschool, home decorating, home LIFE. Homeschool Mosaic Review: Spanish for You! I’ll never forget the day when, out of the blue, my 3 or 4 year old daughter counted to 10 in Spanish. Her pronunciation was a bit off in some cases, but the intent was very clear. I was so proud of her–and so astonished! I wasn’t teaching her another language. But, as it turns out, she was internalizing more of those Dora the Explorer shows on Netflix and Dora books that we were reading more than I realized. During that time, she also picked up a few more random words, which was fine by me, but other than clarifying pronunciation now and again, or refreshing her memory on what the words meant, I didn’t really push her to learn more. At her age, I just didn’t see the need. So I admit that I was hesitant when asked to review the Spanish for You! language curriculum for Mosaic Reviews, because my daughter’s only in kindergarten. She’s still learning how to read and write in our own language; I didn’t want to pressure her at this point in trying to learn another. I looked over the curriculum I was sent, the Fiestas package, and was a bit overwhelmed with how I would present this material to her. Verb conjugations, vocabulary lists, tests, etc. There are lots of worksheets, but they are text-only and really aimed for a solid reader. All of this makes complete sense, because Spanish for You!’s curriculum is geared for third through eighth graders, not six-year-olds. Allows students at all grade levels to learn the same material at their own pace. Provides lesson plans, worksheets, audio files, flash cards and other activities to present the material in a fun, interactive manner at a low price point. Builds on material already covered in each book with new vocabulary and concepts, yet also reinforces that which has already been learned in other themes. Has already been tested in a school environment prior to its sale, and many students who have been studying with the program are able to start high school Spanish early or at an advanced level. I’ve got a pretty good–if a bit distant now–background in Spanish. I took four years in high school, plus a few semesters in college. Most of my classes were taught only in Spanish (unless something was so brand new, it required English explanations). After awhile, it wasn’t really intimidating; I loved my high school classes because the teachers made it fun. I decided, obvious as it is, that was the key in this situation as well. Take what I could from the curriculum and make it a fun mini-unit about Spanish for my kindergartener. I chose several flash cards from a couple of different lessons in the Fiestas package, and focused on learning just the vocabulary and making the overall experience fun. The flash cards are simple black-and-white line drawings. If they look a little childish, that’s because they are drawn by children. This was intentional, in order to appeal more to the student demographic as well as help keep costs of the overall curriculum down. 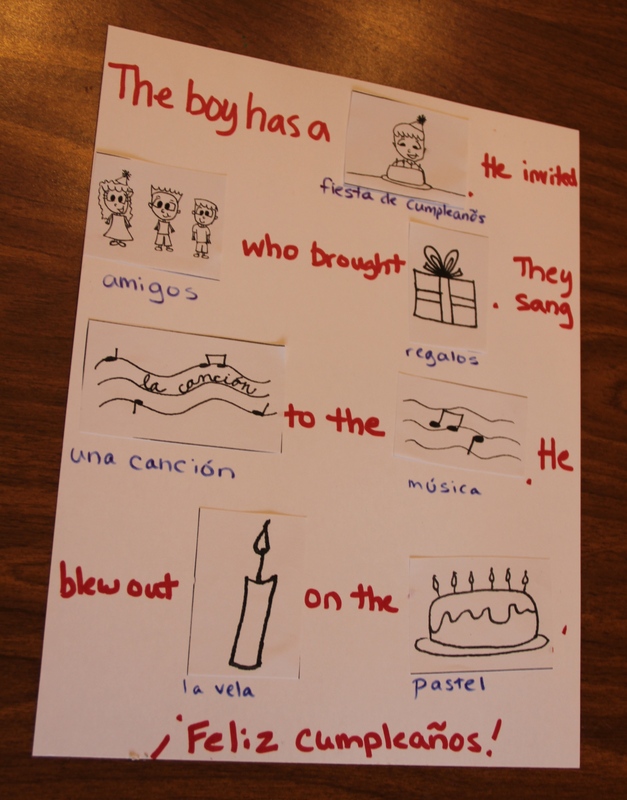 For the Fiesta de Cumpleanos lesson (birthday party), my daughter and I created a little story out of the flash cards. The repetition of it helped her identify and learn the Spanish vocabulary. After she had memorized the words and their meanings, I wrote out the story, leaving blanks for her to fill in the vocabulary flash cards. I read the red parts of the sentence, let her pick out the right flash card and say the Spanish word, and then paste the card in the right spot. I added the Spanish words under the flash cards in blue, although at this age, I’m not expecting her to write or spell out the vocabulary. I also incorporated learning the names of some colors in Spanish with this theme, and we listened to the Happy Birthday songs in Spanish from the audio collection in the curriculum. I really, really wanted to make a pinata (also one of the vocabulary words), but haven’t been able to fit it in our schedule yet. I’m putting it on the list of possibilities for Cinco de Mayo. Even though pinatas are definitely more birthday party oriented than Cinco de Mayo. Another lesson in the Fiestas package is Feria de Abril, or April Fair. This is an annual celebration in Seville, Spain, that lasts about a week and is a time filled with food, flamenco and fun. Aspects of it seem pretty similar to a state fair here in the United States, especially the amusement park rides and the inclusion of animals in the festivities. Two of the vocabulary words for the Feria lesson are paella and churros con chocolate, so we made both of those foods during our study. (Here’s how our paella turned out.) 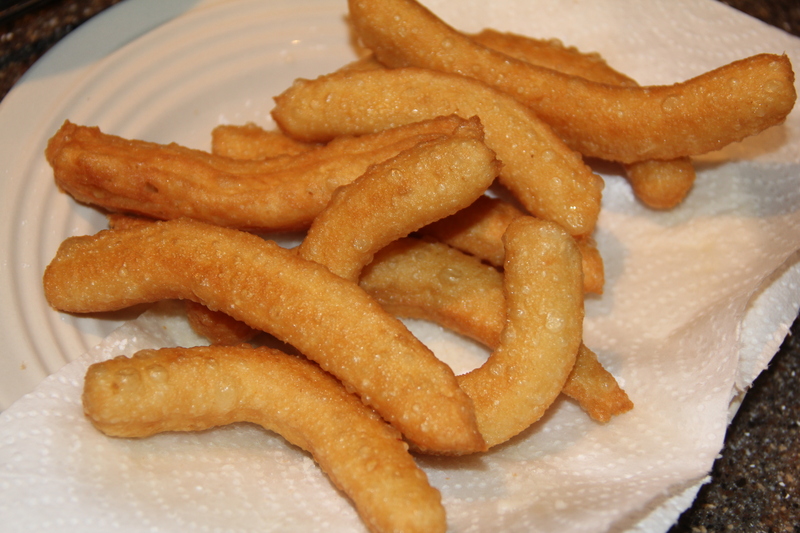 My daughter helped mix up the churros batter, and even though I didn’t have the correct pastry bag tip, the churros were still tasty even if they weren’t quite the right shape. Churros awaiting their fate: dusted with powdered sugar, sprinkled with cinnamon or dunked in warm chocolate? Would all three be a bit much? In addition to making the fair foods, I found a couple of videos of the most recent Feria de Abril on YouTube (like this one, for example), because this year’s fair was going on right during the review period. I pointed out the horses and the flamenco dresses and style of dance (both of which are vocabulary words in the lesson). When the video was over, my four-year-old son asked, “After Daddy gets home, can we go there?” I told him I really wished we could. 🙂 I think he was excited by the glimpses of the fair rides more than anything else. 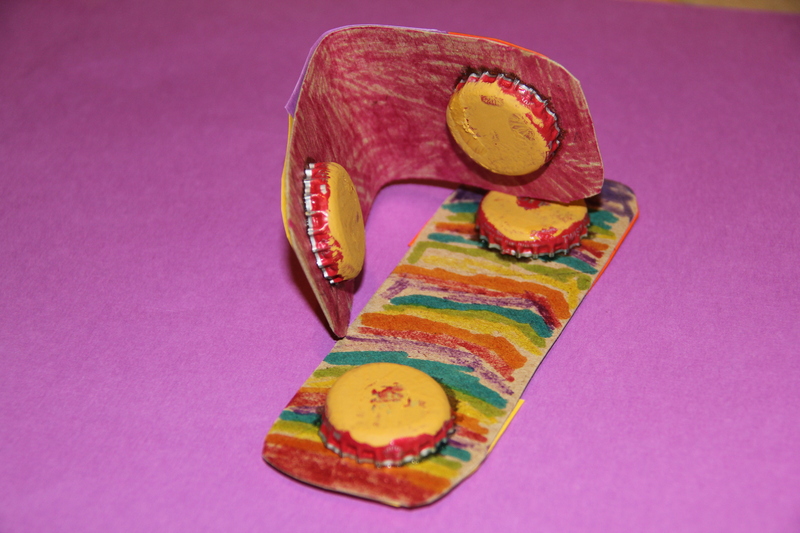 For a musical aspect, we also made homemade castanets to go along with the April Fair theme. The vocabulary list included this word, and I liked the chance to include a musical craft in the unit. I followed this tutorial on Education.com. TG used markers and colored paper to decorate thin cardboard, and then I superglued bottle caps on. We also painted the tops of the bottle caps to cover up the root beer logo, but that proved a bad idea because it muffled the sound a little bit. And the paint chipped off anyway. But the kids have had fun clicking and clacking away with these guys. The native speaker audio. I think that’s a good resource for in-home foreign language curricula, because it helps emphasize correct pronunciation and allows students to hear the words as they would if they were in a region where the language is spoken. The price: around $65 for a year’s worth of language learning for multiple children and multiple age groups–and maybe even less than that depending on your family’s needs. The freebies offered on the Spanish for You web site are great additional material or can provide a starting point with colors, numbers and other basics. It took me awhile to understand the file naming system of the lessons and worksheets. I received an all digital package, so I am unsure whether or not this is a difficulty in the physical book. If I were regularly using it with age-appropriate students, I would probably reorganize them into something that fit my personal system better. While I do like the themes that the curriculum is divided into and the flexibility inherent in that, I wondered if it would be difficult to jump into for someone with little-to-no background in the language. Perhaps for the future, the company might consider a beginners package of some sort to help newbies. The freebies offered online do cover some of those initial basic need-to-knows. Update: Debbie from Spanish for You! has reorganized the worksheet files for the Fiestas and Estaciones themes into folders by grade level, and put audio files into folders according to lessons. These changes should make navigating the information much easier for those who purchase the curriculum from this point on. Thank you, Spanish for You!, for your excellent customer service! As you can see, I used the Spanish for You! curriculum as a starting point to introduce my daughter to some new Spanish vocabulary, culture and experiences. For a kindergartener, though, that’s pretty cool. And it’s something I probably would not have done had I not been reviewing this curriculum, so despite my initial hesitancy, I’m glad I got the chance to do both. For those of you with children in the recommended age group, third through eighth graders, I think Spanish for You! is worth checking out to see if it will fit your needs for a foreign language curriculum. Edit 5/03: Learn how other reviewers used the Fiestas and Estaciones (Seasons) packages from Spanish for You! at the Mosaic Reviews blog. Dawn Overman is a wife, mom to two and freelance writer chronicling her family's mission to educate, renovate and celebrate their life together. Homeschool Mosaic Review: Apologia Picture Book How Do We Know God is Really There?